Break out the pencils, shine up your shoes, and parents rejoice. BACK TO SCHOOL has arrived. 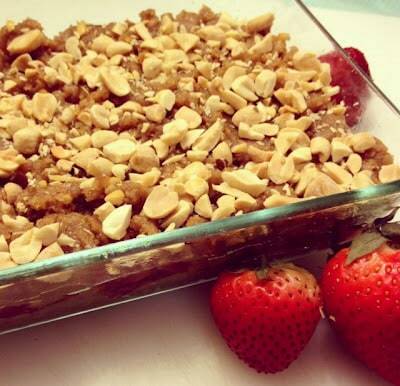 This calls for easy, healthy Peanut Butter and Jelly Bars. Over the last five days, Madison’s population jumped by 45,000+ as students returned to campus for the fall semester. Sorority girls move in flocks, pizza delivery cars have proliferated, and Target’s office supply shelves are wiped clean of all but the cheesiest of folders (Justin Bieber trapper keeper anyone?). Though I’m no longer a student, I still relish the back-to-school vibe. On Tuesday, when I dropped Ben off for his first day of class, I couldn’t help being a little jealous knowing he’d be catching up with classmates, cracking the spine of fresh textbooks, and meeting professors. Though I don’t think law school courses open the way I remember elementary school (“Everyone go around the room and say one thing you did over the summer”), just thinking about that first day left me craving a note on my napkin and a good ol’ fashioned PB&J. PB&J: The original dynamic duo. In honor of back to school, I decided to quench my craving with something really special. Plus, I figured Ben could use a little baked love to numb the mammoth load of coursework he’s already been assigned. This is not your average PB&J folks. It’s ooey gooey PEANUT BUTTER AND JELLY BARS. Now this is starting the school year off right. Imagine two soft peanut butter cookies fell in love and had a yummy raspberry jelly baby. Next, shower this happy family some freshly chopped peanuts. Now, we have an oeey-gooey, salty-sweet, crunchy-creamy bundle of love. As if that’s not beautiful enough, this wonderful creation is whole wheat and uses mostly applesauce in place of butter. I might just have to pack one for lunch! In a large mixing bowl, beat together brown sugar, white sugar, and butter until fluffy. Beat in the applesauce, egg, and vanilla extract until fully combined. Beat in the peanut butter and continue to mix until smooth. In a separate bowl, combine the flours, flax seed, baking powder, and salt. Gradually mix into the wet ingredients, adding a little at a time. Beat until batter is fully combined. Grease an 8x8 in. baking pan. Press half of mixture into the bottom of the pan. Spread with raspberry jam. Crumble bits of the remaining batter over the top of the jam layer. It’s ok if some of the jam peeks through. Top with chopped peanuts. Bake for 45-55 minutes, until the jam is bubbly and the dough is browned. Let cool completely. Cut into bars and serve with a big glass of milk.